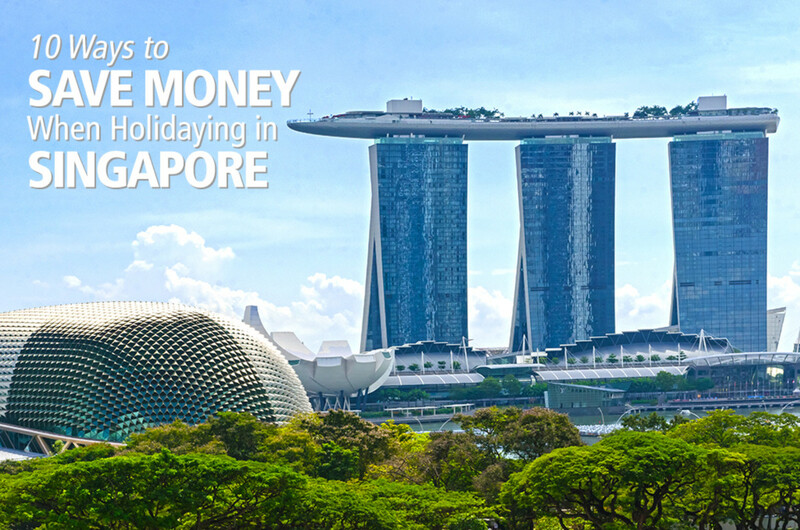 10 Spectacular temples in Singapore to spice up your Asian holiday. 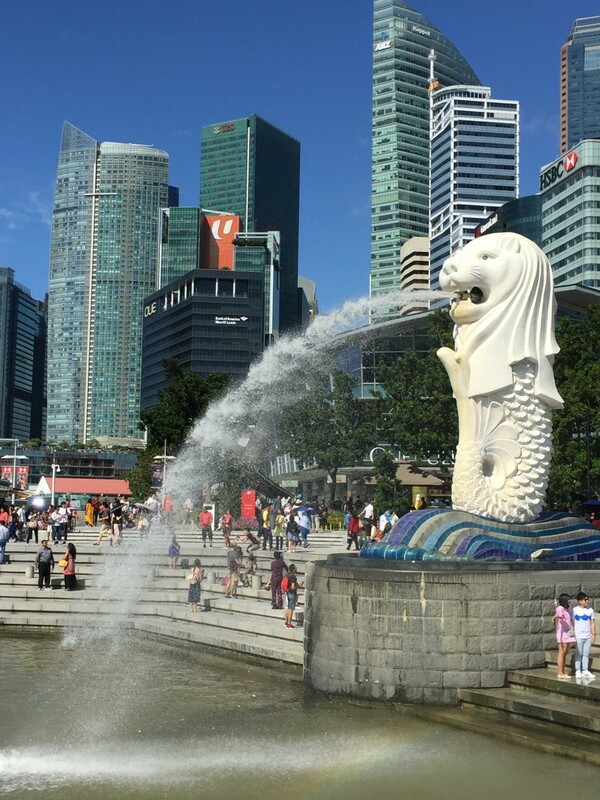 Seeking a more spiritual experience when visiting the multi-cultural Asian metropolis that is Singapore? 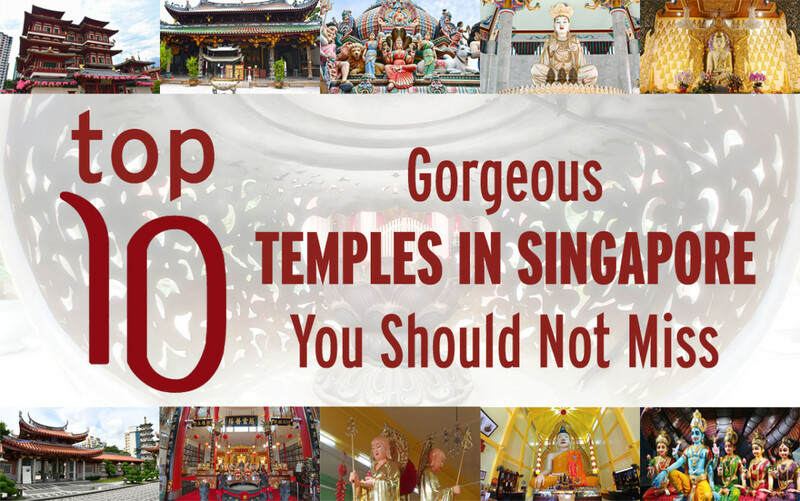 Pop by any of these temples in Singapore for a dazzling and inspirational journey! Note regarding access information: While many of these Singaporean temples are conveniently within walking distance from local subway (MRT) stations, you will still require a map in order to pinpoint their exact locations. 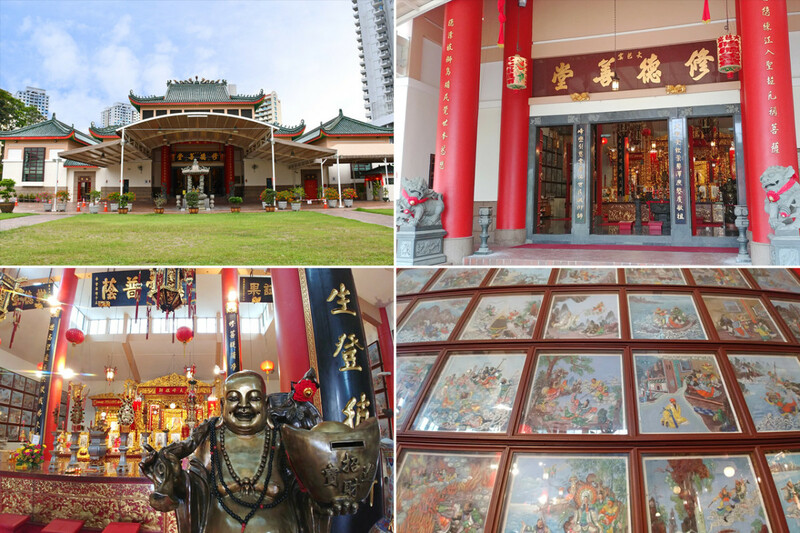 Translated as the “Palace of Heavenly Happiness,” this venerable Singaporean temple flanking the financial district is one of the oldest and most important institutions of worship for the Chinese Hokkien community in Singapore. 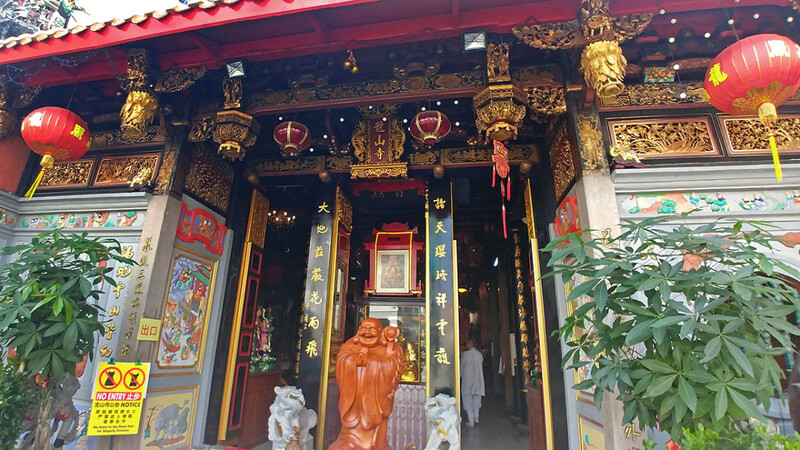 Devoted to Mazu, the Chinese Goddess of the Sea, the temple began as a joss house in 1821, and over the years, was rebuilt with community funds into the atmospheric complex it is nowadays. Architecture wise, Thian Hock Keng Temple reflects classic Chinese design, in which a cluster of buildings encloses a peaceful central courtyard. Of note here for visitors is at the elaborate main entrance with its many golden motifs. 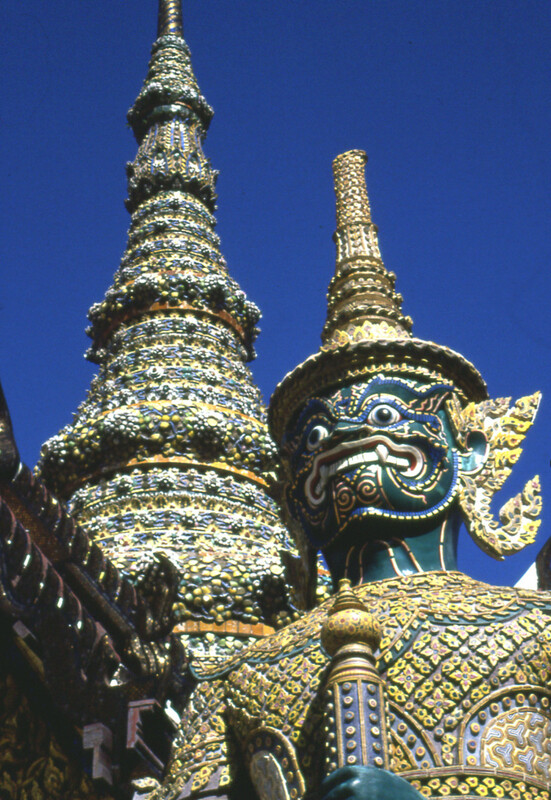 The culture and heritage depicted by these carvings are a refreshing contrast against the ultramodern skyscrapers that surround the temple. 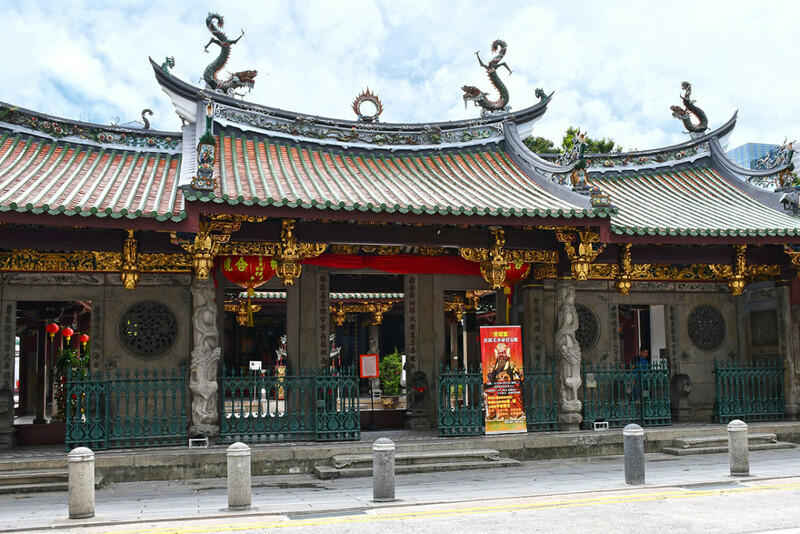 Access Information: Thian Hock Keng Temple is approximately ten minutes’ walk from Tanjong Pagar MRT Station on the East West Line. Thian Hock Keng Temple used to face the sea till reclamation works in the 1880s. 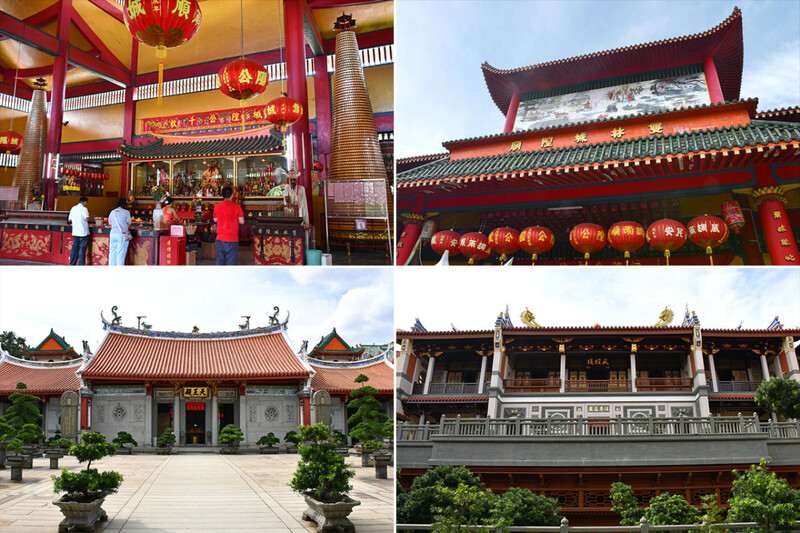 Like many other Chinese temples in Singapore, Thian Hock Keng temple consists of various structures enclosing a central courtyard. 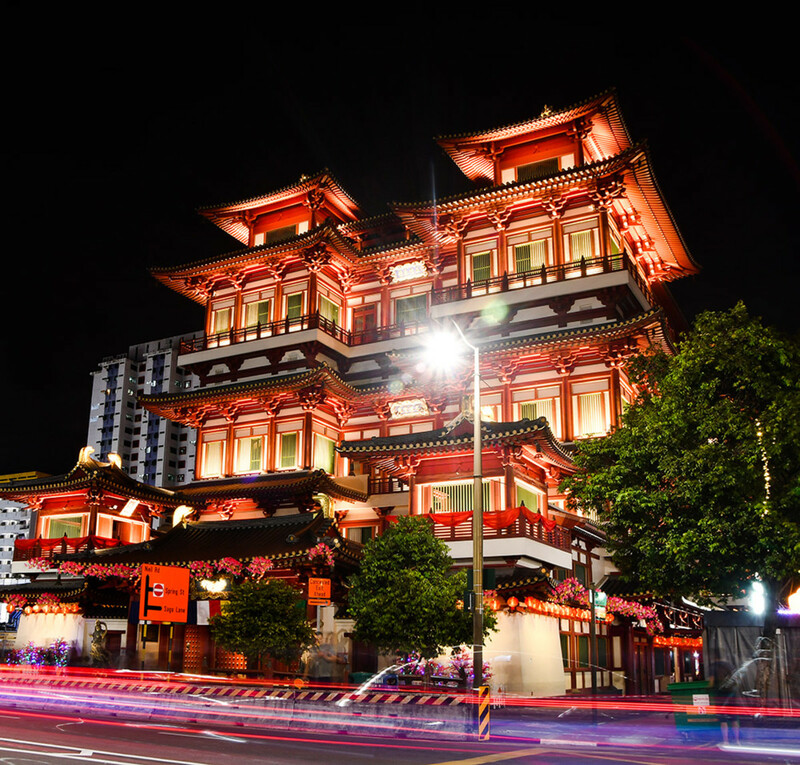 Opened amid much fanfare in 2007, Singapore’s famous Buddha Tooth Relic Temple and Museum is nowadays one of the most iconic landmarks in the Chinatown district as well as a must-visit on most tour group itineraries. 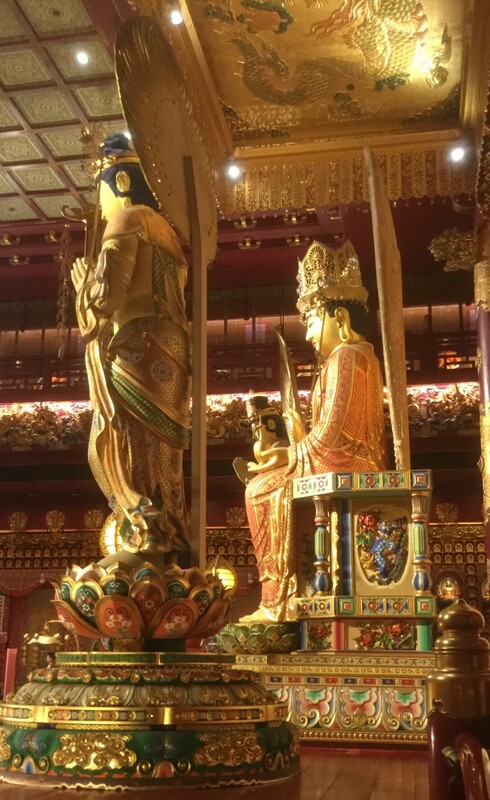 Inspired by Chinese classic Tang dynasty architecture and housing a splendid golden interior, the temple is equally renowned for its Tibetan influences and for being the home of a Buddha tooth relic recovered in Myanmar in 1980. When visiting, do not skip the museum on the upper levels, the art and history collections of which easily rival those of major temples in other parts of Asia. 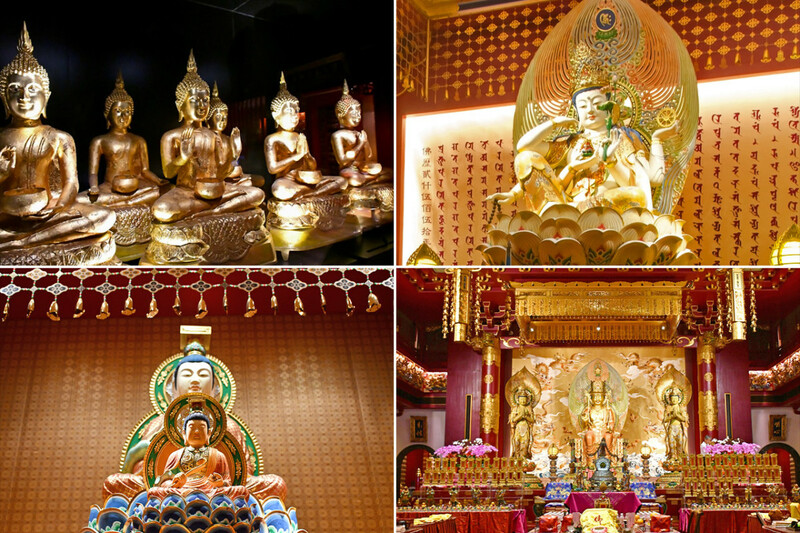 The precious Buddha tooth relic itself is housed in a golden repository on the fourth floor. Believe me, entering this repository is akin to stepping into the heart of an astonishing Tibetan mandala. Access Information: The temple is a few minutes’ walk from Exit A of Chinatown MRT Station on the North East Line and Downtown Line. The Buddha Tooth Relic Temple and Museum is terrifically atmospheric when illuminated at night. Upper levels house a stunning repository of Buddhist art from various cultures. The most comprehensive in Singapore. Singapore’s oldest Hindu temple is interestingly not in the Serangoon Little India district but on the outskirts of Chinatown. A mere three minutes’ walk away from the Buddha Tooth Relic Temple, to be exact. 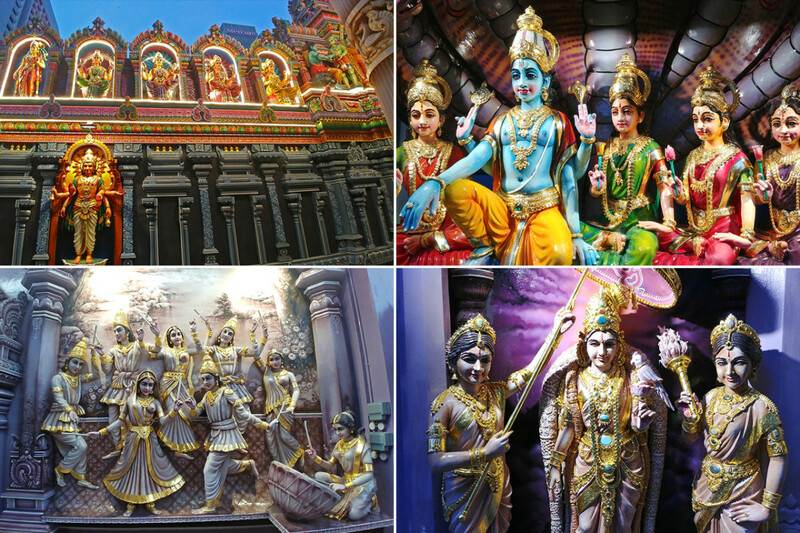 Established by Southern Indian business pioneer Naraina Pillai in 1827, the temple is dedicated to Mariamman, the Hindu Goddess of Rain, and over the years, has developed into an important community institution for South Indian Tamil Hindus in Singapore. In recent years, the temple is also famous for its annual fire-walking (timiti), which typically takes place in October. 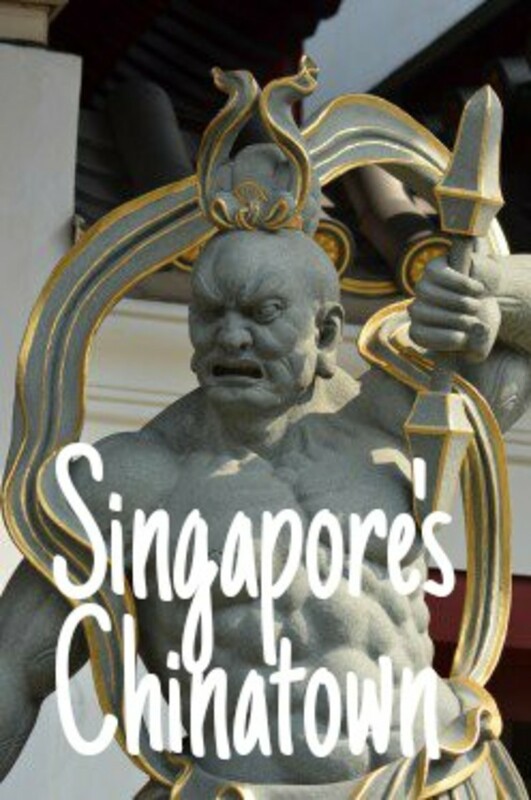 For tourists and non-devotees alike, what’s most fascinating about this historical Singaporean temple are undoubtedly the six-tier Dravidian gopuram capping the entrance and the abundant mythological statues within the temple complex. For those who are familiar, you will find all major Hindu divinities and legends represented here. Access Information: Use Exit A of Chinatown MRT Station on the North East Line and Downtown Line, and head down Pagoda Street. The street was named after the gopuram. 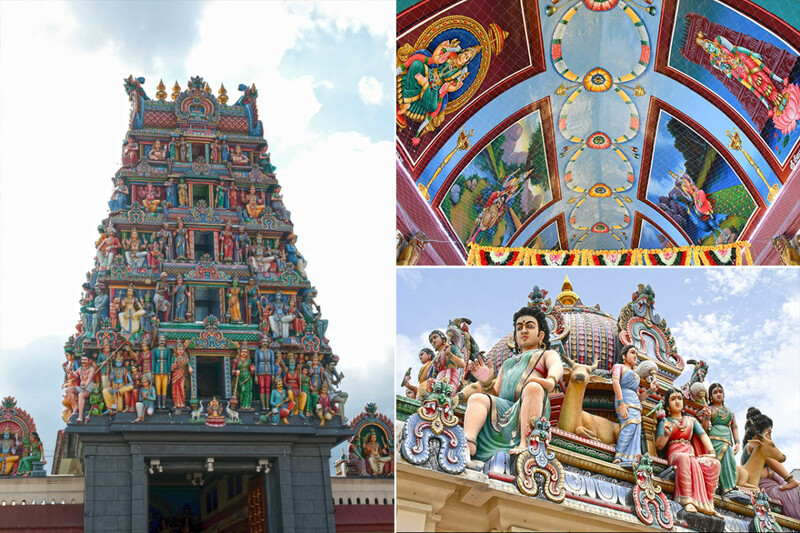 Sri Mariamman Temples is one of the easiest temples in Singapore to visit. Visitors interested in Hindu mythology and legends would be fascinated by the temple’s many statues too. As is typical with Dravidian style Hindu temples, the most eye-catching feature of Sri Mariamman Temple is its incredible gopuram, or entrance tower. Singapore’s largest Buddhist monastery is somewhat of an exotic Buddhist wonderland in recent years. Nestled in the heart of the city-state and originally a small forest temple, this beloved Buddhist institution has since grown into a sprawling complex that includes gardens, a decorative corridor, and even a huge golden stupa. 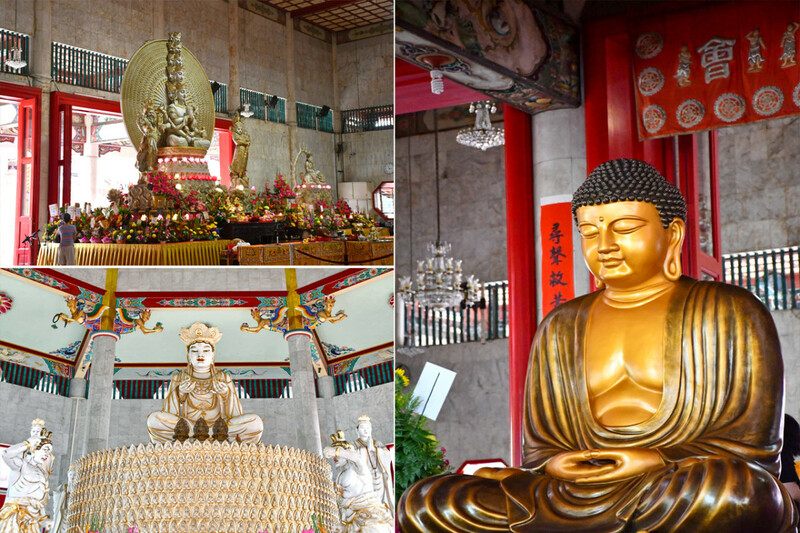 More popularly known among Singaporeans as Guang Ming Shan (Bright Hill, the location of the site), the monastery is today one of the foremost Buddhist institutions of Singapore, with elaborate veneration ceremonies conducted each year during Vesak Day. Of note, Kong Meng San Phor Kark See Monastery is doubly famous for its second abbot, the Venerable Hong Choon. The abbot is popularly believed by older Singaporeans to be one of the personal advisors of Singapore’s founding Prime Minister Lee Kuan Yew. During Lee’s funeral in 2015, 15 years after the passing of the abbot, Phor Kark See conducted the primary Buddhist prayer rituals for him. Various other famous Singaporean Chinese personalities also received their final rites from the monastery. Access Information: The easiest way to reach this temple complex is to head to Bishan MRT Station on the North-South Line and Circle Line. From there, cut across the shopping complex to the Bus Interchange to hop onto Service 410. (Additional payment required) The bus stops right before the complex, the seventh station as of 2018. With well over ten independent structures, Kong Meng San Phor Kark See Monastery features an absolutely eclectic mix of Buddhist architectural styles. Clockwise from upper left, Bodhisattva Avalokitesvara, Shakyamuni Buddha, and Vairocana Buddha. 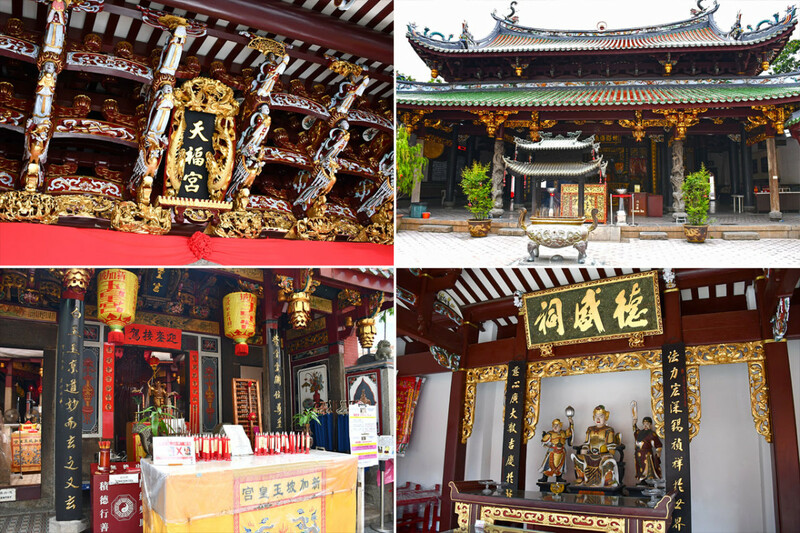 Similar to Chinese temples in other countries, it is not uncommon to find both Buddhist and Taoist divinities revered within the same temple in Singapore. The Lian Shan Shuang Lin Temple complex in the Toa Payoh residential district is a foremost example of this. While officially referred to as a monastery, the grounds also include the airy Lian Shan Cheng Huang Miao, a huge shrine devoted to the worship of the Taoist city god and other Chinese deities. Architecturally, the main monastery is a serene paradise, with design elements mirroring those of temples in Southern Chinese provinces like Fujian and Zhangzhou. For visitors keen on photography, Lian Shan Shuang Lin Temple has a fabulous seven tier gold-topped pagoda. This religious landmark, backed by the signature public housing blocks of Singapore, will provide for a most distinctive Singaporean shot. Access Information: 15 minutes’ walk from Toa Payoh MRT Station on the North South Line. You’d require a map to navigate through the dense housing estate surrounding the temple. Despite facing a major highway, Lian Shan Shuang Lin Monastery is a meditative paradise the moment you step through its gates. Lian Shan Cheng Huang Miao venerates a bewildering number of Taoist deities and Chinese folkloric heroes, which is typical for Chinese temples in Singapore enshrining the City God. In most cases, names are unfortunately only displayed in Chinese. 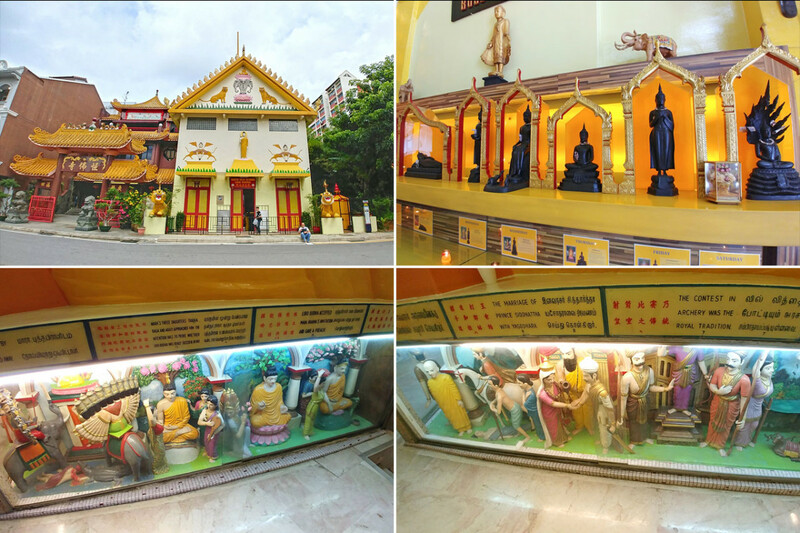 The oldest Theravada Buddhism institution in Singapore and the only Burmese temple in the city-state, Maha Sasana Ramsi is one of the smaller temples in Singapore on this list. 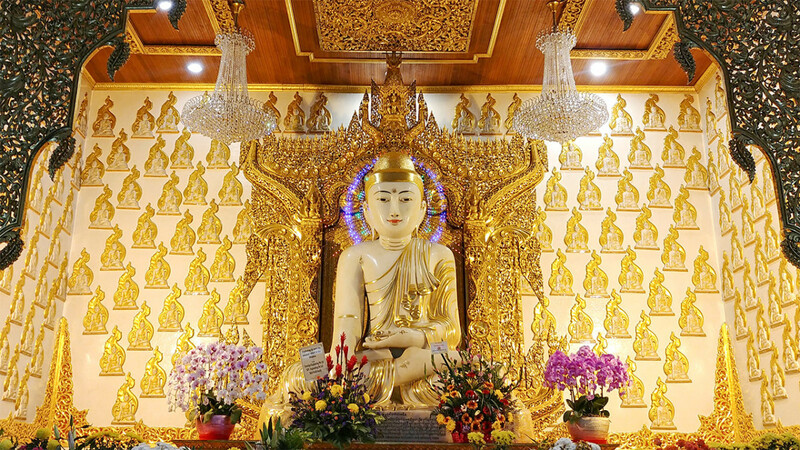 Established in 1875 by Burmese immigrant U Thar Hnin, the temple is famous for its impressive three-meter pure marble Buddha statue, the largest of its kind outside of Myanmar. At the same time, the grounds also contain a Bodhi tree, as well as a spacious meditation hall with a glided standing Buddha for devotees to practice meditation. 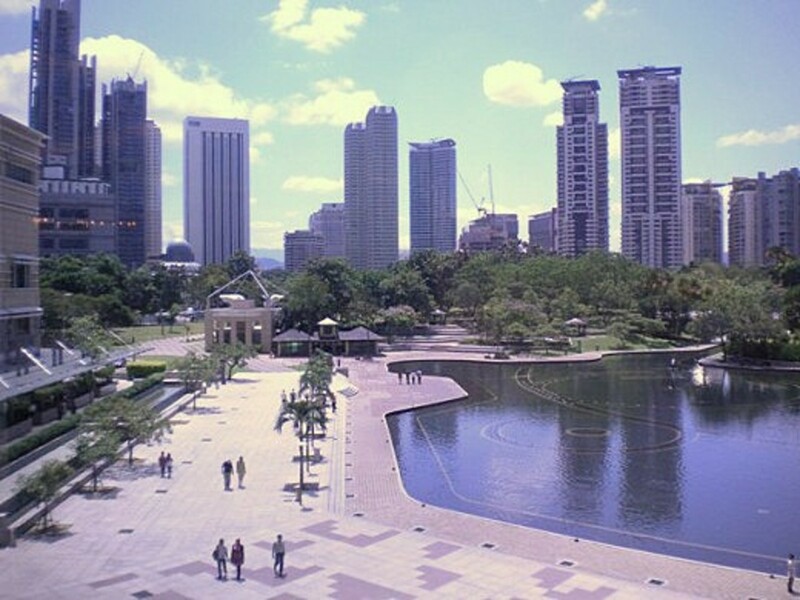 For tourists, Maha Sasana Ramsi is conveniently located beside the restored Sun Yat Sen Nanyang Memorial Hall. A visit to both can easily be completed within an hour. Access Information: The Burmese Buddhist Temple is a rather complicated walk from Toa Payoh MRT Station on the North South Line. An easier way would be to take a taxi from Toa Payoh MRT Station. While not as ornate overall as the Buddha Tooth Relic Temple, the main altar of Maha Sasana Ramsi is still a spectacle to behold. All visitors are welcome to meditate at the upper level. Free booklets on Buddhism are also available within the premises. Seu Teck Sean Tong is more of a neighborhood temple rather than a major religious landmark of Singapore. However, take a look at its entrance archway and you’d agree it belongs on any travel listicle about beautiful temples in Singapore. 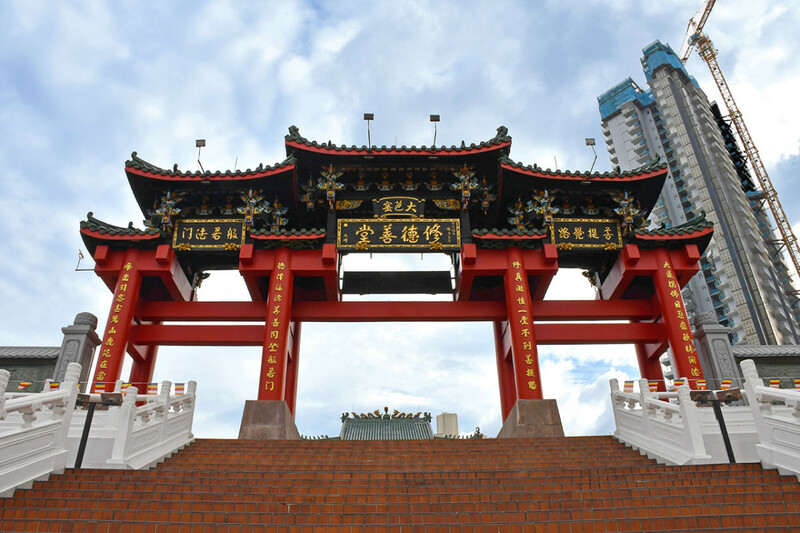 Nested on a knoll within the Toa Payoh residential district, the majestic entrance not only evokes the impression of a mountain temple, with the right photographic angle, it also delivers a distinctive Wuxia final duel flavor. For visitors uninterested in photography, the interior of the main worship hall is flanked by over a hundred colorful Chinese paintings depicting the events of Journey to the West i.e. the Adventures of the Chinese Monkey King. Finally, being within one of the oldest residential districts of Singapore, Seu Teck Sean Tong is walking distance from several hawker centers. You could move on to discover Singapore’s fabulous street food, after experiencing its Chinese cultural heritage. Access Information: Ten minutes’ walk from Braddell MRT Station on the North South Line. When recent neighboring constructions somewhat diminished the view, proceeding up the main entrance of Toa Payoh Seu Teck Sean Tong still evokes a brief sense of adventure. A challenge for fans of Journey to the West! How many episodes can you identify from the paintings flanking the main altar? 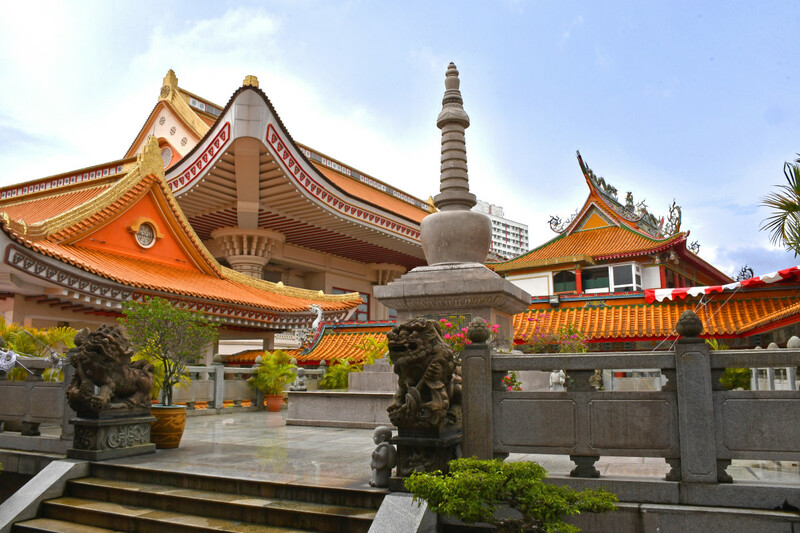 If you seeking a more intimate experience different from the grandeur of the Buddha Tooth Relic Temple or Kong Meng San Phor Kark See, Leong San See is the Singaporean temple to head to. Compacted, with a wonderfully crowded and atmospheric main hall, Leong San See is likely what most newcomers to Asia would imagine a Chinese temple to be. Dim, meditative, with a strong touch of the esoteric too. Beyond the main hall, the temple opens up to a courtyard garden and ancestral worship hall, the former of which contains a bewildering assortment of Chinese statues. A word of note here for those keen on photographing the rear segments. Leong San See is one of the few temples in Singapore that do not openly restrict photography in its ancestral worship hall. However, please do refrain if you see rites ongoing. It is considered extremely rude to photograph grieving families. Access Information: Five minutes’ walk from Farrer Park MRT Station on the North East Line. Use Exit B. While small, Leong San See is filled to the brim with beloved Buddhist and Taoist divinities. Because of the architectural style, entering the rear segment also affords a taste of Singapore living during the 1960s. Literally a stone’s throw away from Leong San See, as in it is just across the road, Sakya Muni Buddha Gaya Temple is a temple of extremes. 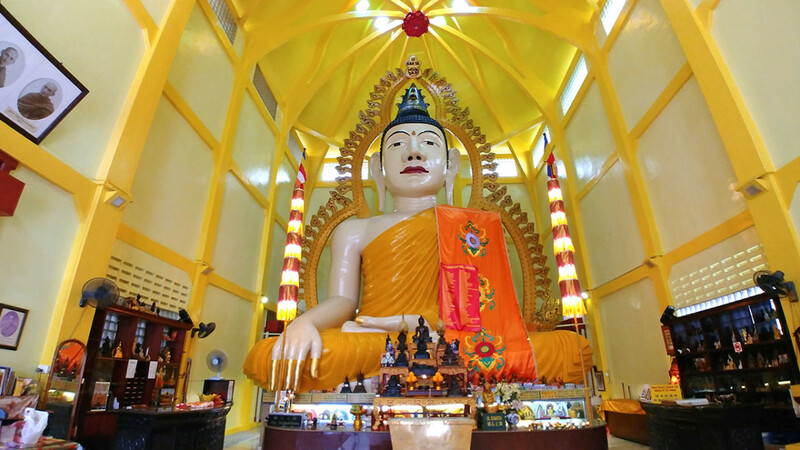 While comparative small compared to other well-known Buddhist temples in Singapore, its key feature is an immense 15-meter tall seated statue of the Buddha, one that weighs near 300 tons. Encircling the Buddha are also various elaborate dioramas depicting the life and enlightenment of the Sakya Muni i.e. the Buddha, in addition to a tiny room underneath the altar venerating a reclining Buddha. Because of the stylized aura lit by bulbs surrounding the huge Buddha, the temple is alternatively called the Temple of 1,000 Lights. Regrettably, it is nowadays difficult to visit the temple when the bulbs are lit. They are not switched on in the daytime and the temple closes daily before 5 pm. 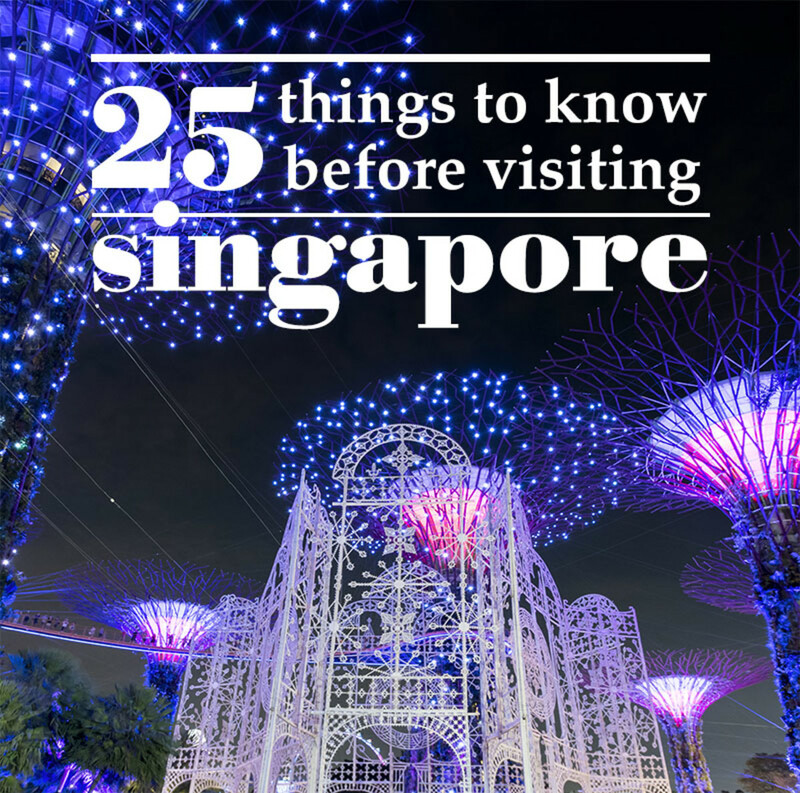 If you have the chance to visit in the evening, such as during Vesak Day celebrations, consider yourself as having encountered one of Singapore’s most spiritual sights. Somewhat similar to the Daibutsu at Kamakura, Japan, there is a hidden alcove within the immense Buddha accessible via a small staircase at the back. Visitors familiar with Theravada Buddhism would immediately recognize the strong Thai influences in Sakya Muni Buddha Gaya Temple. 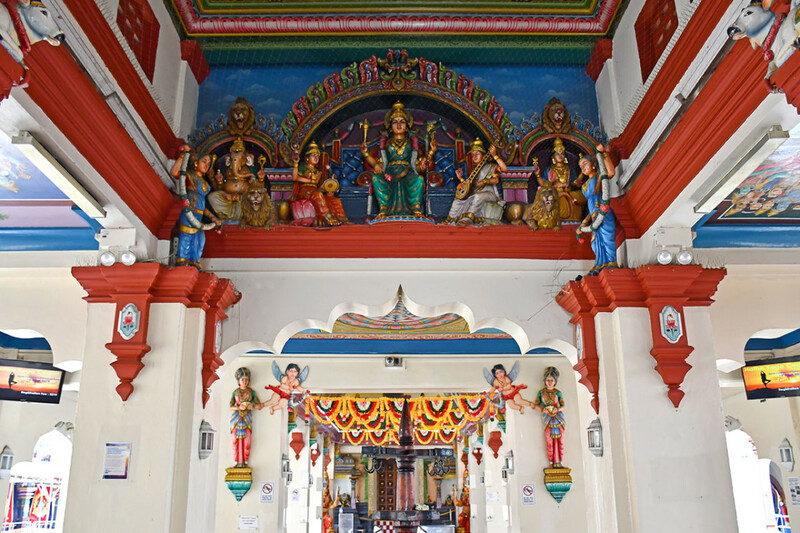 At the fringe of the Bugis heritage district is Sri Krishnan Temple, a 148-years-old Singapore Hindu temple devoted to Hindu savior Krishna and his consort Rukmini. Comprehensively restored after four years of detailed work, the compact complex is currently a vibrant repository of Southern Indian religious art, with colorful, eye-catching statues and wall reliefs at every turn. (And an elaborate fountain at the rear) Strongly recommended is a Friday evening visit, when the entire temple comes alive with prayer and lights. The beauty of the exotic sculptures underneath the blue evening sky is positively surreal in feel. Mixed with the scent of jasmine flowers and incense, and the singsong prayers, it is a mystical experience you are unlikely to soon forget. Access Information: The nearest MRT station is Rochor MRT Station on the Downtown Line. From there, Sri Krishnan Temple is approximately five to seven minutes away. Reopened in 2018 after years of restoration, the many sculptures of Sri Krishnan Temple would delight visitors fascinated with Hindu mythology. The blueish design theme is not coincidental. 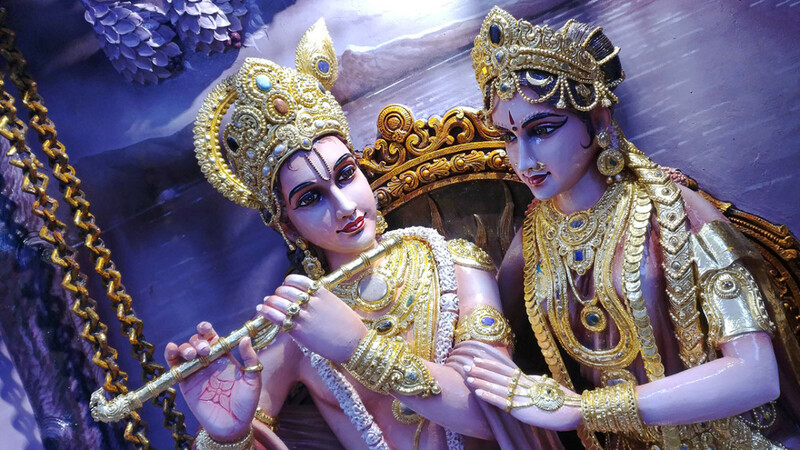 It reflects Lord Krishna’s most famous feature i.e. his blue skin. 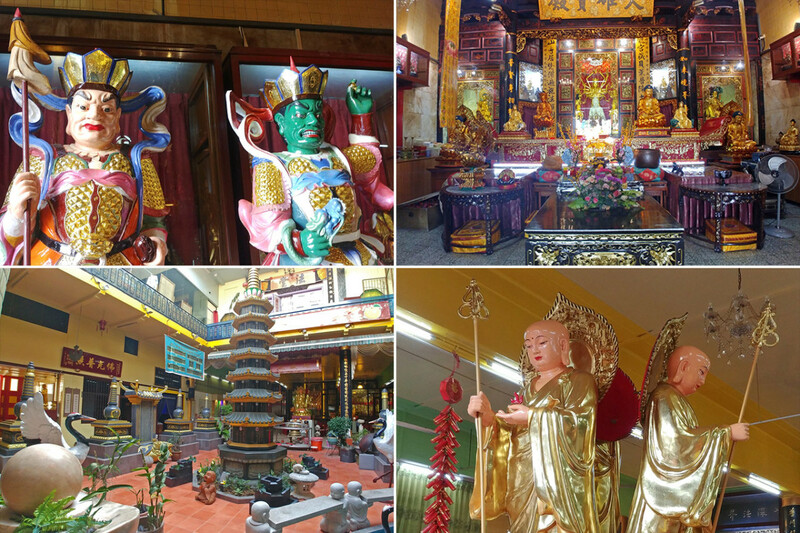 If your appetite for Buddhist, Taoist, and Hindu religious art is whetted after visiting the above recommendations, consider dropping by the following 5 Singaporean temples too. These offer a slightly different experience than the ones mentioned above. Kuan Yin Thong Hood Cho Temple: On Waterloo Street and right next to Sri Krishnan Temple, this shrine to the Buddhist Goddess of Mercy—Kuan Yin—is one of the most popular temples in Singapore. While there’s not a lot to see, the temple is swarmed by devotees every Chinese New Year’s Eve. Making it, in a way, one of the best places in Singapore to experience Chinese New Year festivities. Sree Maha Mariamman Temple: Ever wonder what’s it like inside a golden palace? This Hindu temple in the northern part of the city-state will give you a pretty good idea. Sri Srinivasa Perumal Temple Singapore: Like Sri Mariamman Temple, Sri Srinivasa Perumal Temple’s main attractions are its exotic gopuram and many mythical sculptures. The entrance is five minutes’ walk from Sakya Muni Buddha Gaya Temple. Every January/February, it is also the starting point of the annual Thaipusam procession. Palelai Buddhist Temple: Hidden away on a quiet hilltop in the Bedok residential district, this is one of the few places in Singapore where it actually feels like you’re in a Bangkok suburban neighborhood. Kusu Island Chinese Temple: For something really different, take a ferry and venture out to tiny Kusu Island. 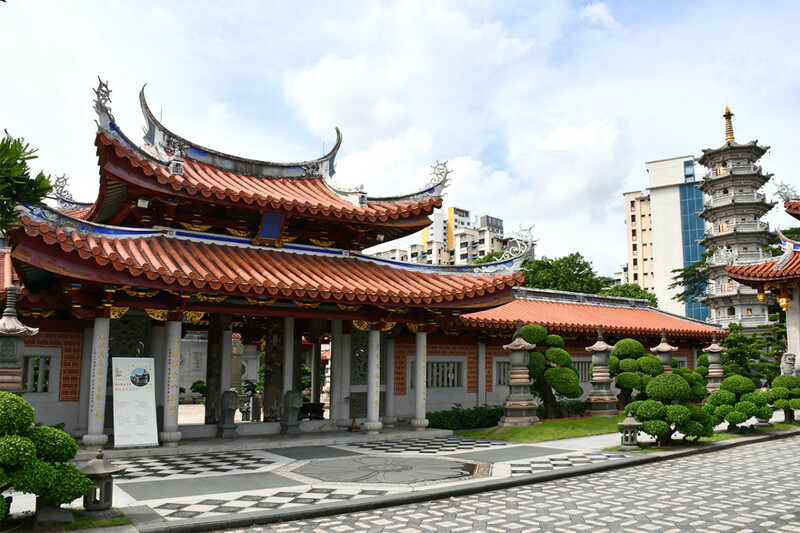 One of the last remaining coastal temples in Singapore, the temple has a large pond complex, with the island itself also one of the best places to enjoy the Singapore skyline from afar. Thanks for commenting, Linda! Hope you come and visit us soon. The temples look ornate and very interesting. I love your photos. Combined with your descriptions, they create an enjoyable and informative article. If I ever go to Singapore, I'll definitely visit some of the temples. Hey Mary, thanks for your comments! You should definitely visit more of these temples the next time you're here. 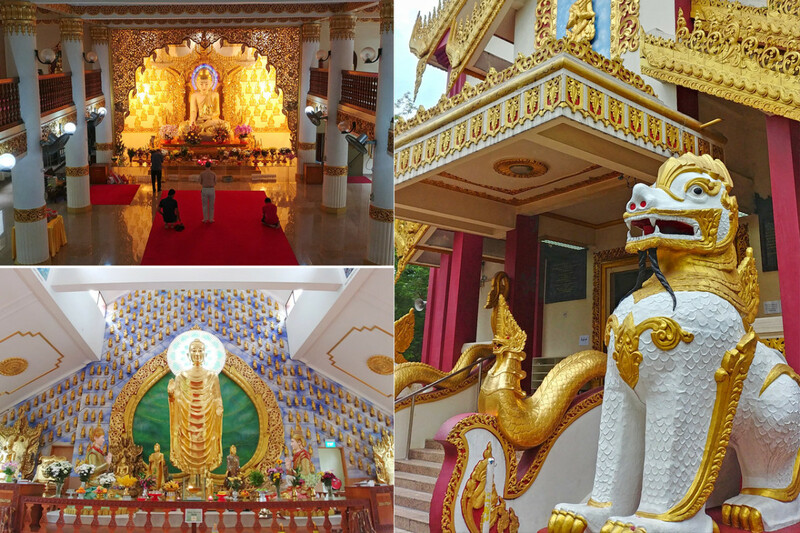 The museum at the Buddha Tooth temple is absolutely fantastic. What a great presentation enhanced by the way you put the pictures together. I have only visited Sri Mariamman Temple. Next time I visit, I will certainly visit these others.